This page is for autographs of basketball players who are ACTIVE. 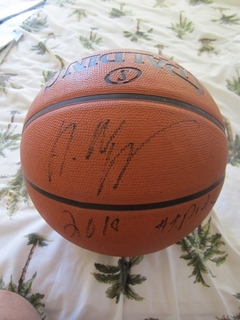 We have a wide selection of autographs from Vince Carter, Dwight Howard, Kevin Love, Stephon Marbury, Dirk Nowitzki, Karl-Anthony Towns, Andrew Wiggins (autographed and inscribed NBA basketball shown here) and many other All-Stars and future Hall of Famers. Mike (Coach K) Krzyzewski autographed Duke 2001 National Championship Five Point Play book inscribed Follow Your Heart! Jay Wright (Villanova) autographed 6x6 basketball hardwood floor inscribed GO CATS!